When you live in the Blue Ridge Mountains in winter you never know if or when you might be able leave home. We actually love "Snow Days" now that our Bluemoonistic offices are right here in our own little piece of heaven we call Blue Moon Ridge. With woods and mountains all around us, snow offers many photographic opportunities. However, there are times when we wish the roads were passable and we could travel to an area where the sunset or moonrise were easier to capture. This week when every photographer was talking about the Super Blue Blood Moon and the total lunar eclipse, even we had moments when we wished we could travel to the west coast where visibility was going to be much better. Even though that wasn't an option for us, we decided to do what we do best - improvise! We decided we may not be able to capture this event in the perfect location with perfect weather conditions (which never seems to happen no matter where you are! ), we could try to take the best possible photos of that Man in the Moon right in our own back yard. Indeed this moon was certainly close to the Earth just as they predicted and it looked huge up here at our 3500 ft elevation! Yes, the temps were cold and the moon came up and went down at less than optimal times, but our Bluemoonistic photographer was dedicated to finding the best locations right here at home. With a little bit of moon chasing and getting up early, he managed to capture some great shots. He started two days before the actual full moon. 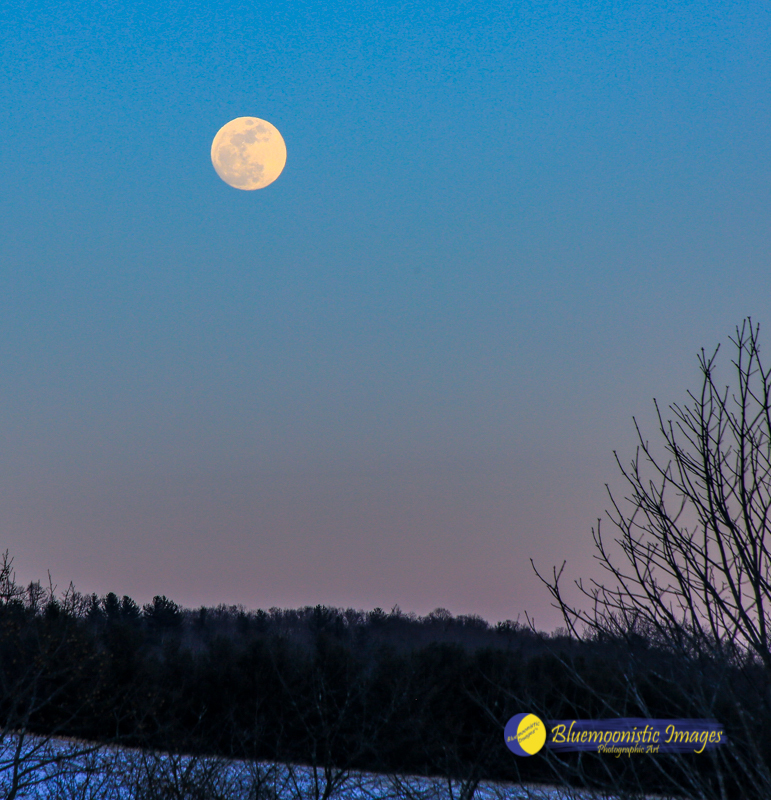 The "blue hour" of dusk offered just that opportunity even though the moon wasn't quite full yet. A moon this size was very photogenic for several days! First of all, just a brief explanation as to why "blue moons" are very special to us. The first month that we moved into our cabin here in Ashe County in May 2007, there were two full moons. Thus, being up on a lovely little ridge, we decided to call our mountain home "Blue Moon Ridge". So when 2018 was going to begin with two full moons we knew it was a good omen! 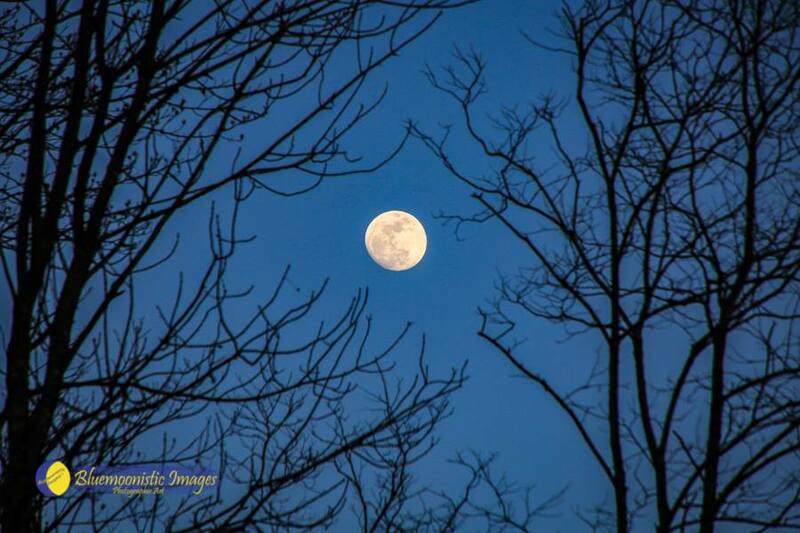 The first full moon was on the first day of the month and the second on the last - wow, how special is that! On January 30 we had 4 inches of snow but by evening enough snow had melted that we traveled into town to capture the moon rise. Since we have mountains all around West Jefferson and Jefferson, catching the moon coming up directly on the horizon is a challenge. This gives you an idea though of how big this moon really was. 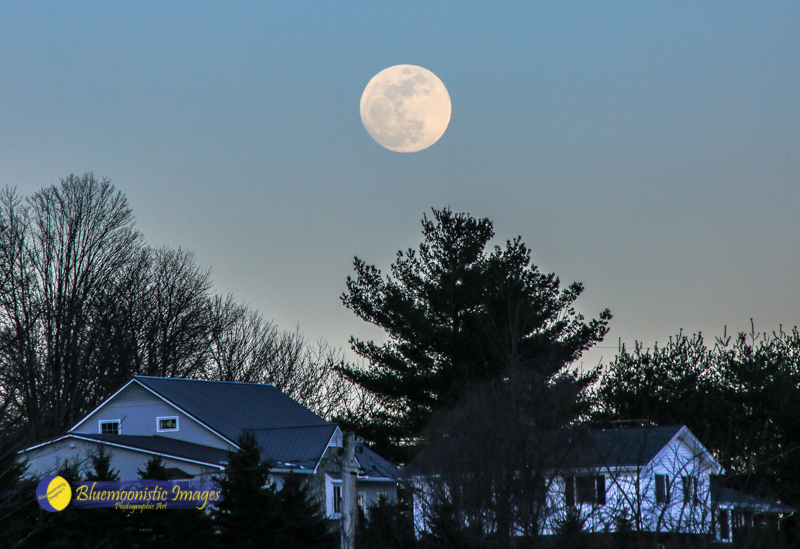 It is always great when moon rise comes a little before dark so that one can see the surrounding landscape. Perspective is especially important in this case. The trifecta of celestial events, however, happened in the early morning here between 6:30 - 7:00 am on January 31. This meant getting up early the next morn also. As suspected, since we are in the midst of a mountain range, we did not get to experience the red glow or lunar eclipse. 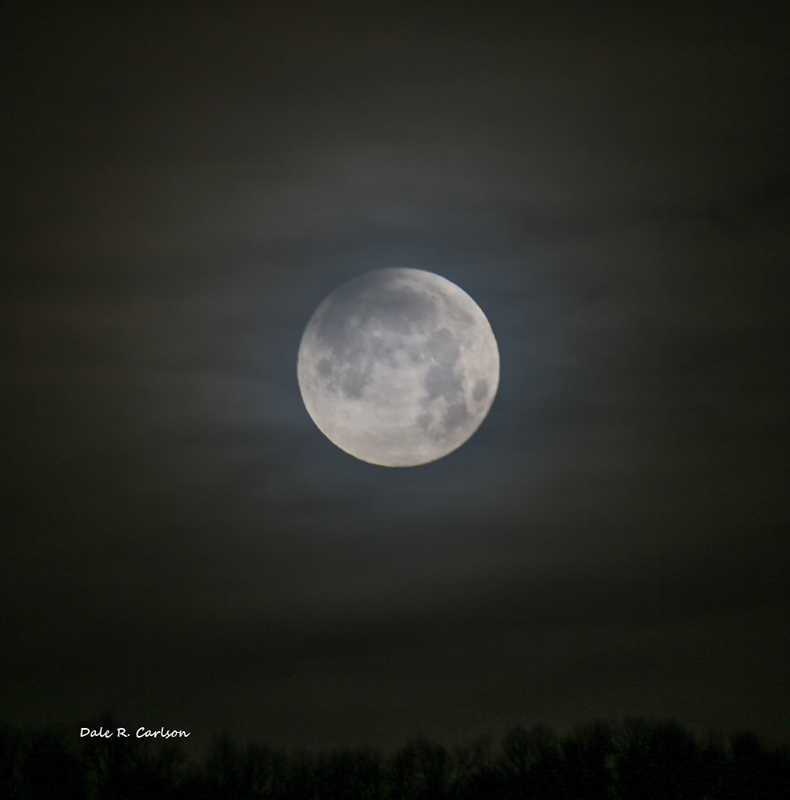 Luckily for us the moon set, however, was directly in the Blue Ridge Electric power cut next to our home. Thank heavens for small favors! At its zenith before it dipped down between the mountains, one could truly see how HUGE this moon really was. The tree line directly below looks dwarfed. Watching it sink into the mountains was an amazing and humbling experience. Since we didn't get to experience the lunar eclipse or the orange glow, we are calling this one the Super Snow Blue Moon instead! We were very happy that we didn't let this opportunity pass us by even though we were not in "the zone" of perfection. It seemed pretty perfect to us regardless. Proving to us once again that things right here in our own backyard can be the best adventure! Never take "home" for granted.